All of the latest research points toward the effectiveness of differentiation for learning. But figuring out how to differentiated can sometimes be tricky. If you are trying to differentiate the learning environment in your classroom, why not try task cards? We all know that not every student learns the same way; therefore, we need to design lessons and tasks that are based on our student’s learning styles. Task cards are just what they sound like. They are cards that have tasks on them for the students to complete. Task cards can be made to target any learning objective you want studied. They can be used for grammar, math practice, word problems, parts of speech, historic events, science principles, and more. Task cards are a wonderful alternative to worksheets, and the students love them because each card focuses on only one task. Imagine that you are a struggling student being given an entire worksheet to complete. You would probably feel very overwhelmed. However, if the tasks on that worksheet were given to you one at a time, you might feel a sense of accomplishment when one task is completed before moving to the next one. Digital task cards are basically the same thing as a paper task card except they are, of course digital. Students can access and complete the task cards from any computer or device. A task card will usually include a title and a number and perhaps instructions, definitions, or examples. A border and clip art can be included to jazz up the task card. Let’s take a look at two sample digital task cards I created in G Suite. You will see how easy it is to differentiate and scaffold instruction with these task cards. This set of task cards was created in Google Slides. Students select the part of speech by highlighting the correct choice option. They can complete any or all of the task cards. Give them some choice. Along with your task cards, you can include Challenge Cards that might include open-ended questions or require longer responses. The last card in this example is a challenge card that requires the student to actually type out the part of speech that appears in the sentence. If students need to answer questions verbally, these cards can easily be replicated in Google Docs. That way, students can use the voice typing tool to speak their answer choices. Get your own copy of the Google Slides Task Cards template here – Google Slide link. Give your visual learners a few task cards to complete that enable them to draw their answers. Drawing helps students visualize their learning. For some students, a picture really is worth a thousand words. 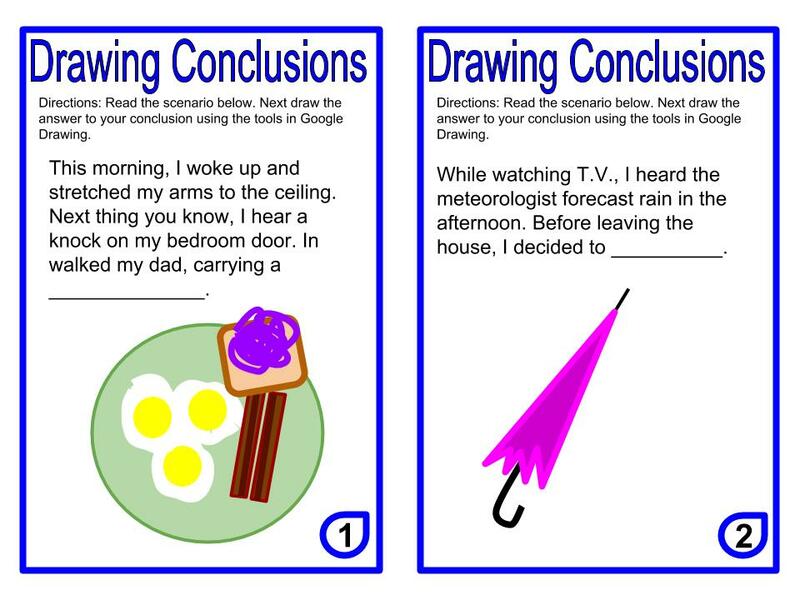 This set of task cards was created in Google Drawings. Students read the scenario, come to a conclusion, and then draw their answer utilizing the drawing tools. There are two different task cards in this example; however, you can create them with fewer or more cards. Get your own copy of the Google Drawings Task Cards template here – Google Drawings link. 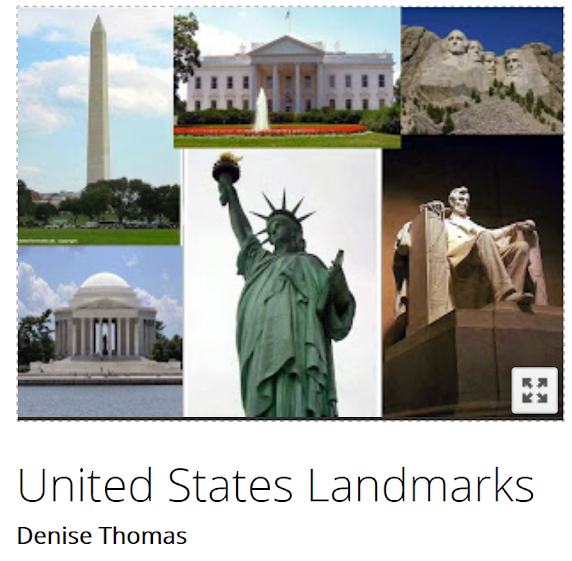 Introduce a new topic by sharing digital task cards with groups of students. Have them work on the task cards as a whole group activity and then have one person in the group “share” the completed task cards with you. Assess student learning by using digital task cards as exit tickets that you can share with individual students. Again, once completed, the students can then “share” them with you. Set up one or two technology stations in your classroom as a center where your students could complete the task cards. This could even be an activity for those students who finish work early. Digital task cards open up so many possibilities for differentiating and scaffolding in your classroom all year long. They provide students with alternative ways of exploring and expressing key ideas and using key skills. With task cards, students can work independently at their own pace. Different students with different needs and abilities can be given different task cards. Task cards give opportunity for choice and provide a challenge that is just beyond what your students can already do. In addition, they enable students to progress toward stronger understanding and, ultimately, greater independence in the learning process. If you are looking for even more strategies to use in your classroom, join us for the Innovative Learning Strategies Conference on September 13-14. In addition, don’t forget to join us for our monthly Get Your Google On webinars to learn more ways to use Google to differentiate for your students. Do you or your staff need more training in effectively differentiating for all learners? TCEA can provide onsite, customized workshops for you at a very reasonable price. 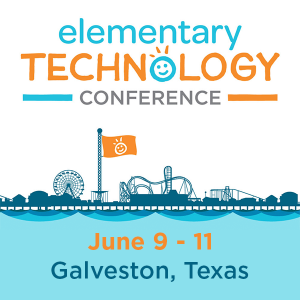 And each attendee will also receive a complimentary one-year membership in TCEA, allowing him/her to continue the learning the entire year. Contact Dr. Bruce Ellis for more information and a quote for your staff development needs. “We’d like to meet and discuss our upcoming Chromebook deployment,” said the director. “We want to make sure we’re checking all the boxes.” As I prepared for the upcoming meeting, I took a variety of steps and spoke to other technology directors. For each person, I asked them, “What are your top five tips for a Chromebook deployment?” Their responses enabled me to put together a helpful checklist. In this blog entry, I’ll explore offer five steps for your review. At the end of the blog entry, you will find a link to a Chromebook Deployment Checklist. In one of my favorite books, John Kotter’s Our Iceberg is Melting, creating a sense of urgency is paramount. The book’s story is of penguins facing a life-altering problem. The main points in the book move a colony of penguins from ignorance to action. How do you build that sense of urgency? Create or get a benchmark assessment that provides insight into an unknown area. That area is how well teachers are impacting student achievement. Technology should be a part of that assessment. Several assessments that you can use include Clarity Brightbytes (watch video). Another is the Levels of Teaching Innovation (LOTI). Often, few believe that current teaching, learning, and leading needs to change. The status quo works, so why change? Once you have completed the assessment, you know where the gaps are. How do you get forward movement? One way involves adopting a new standard. Then, align all work to the standard. Make the new standard the measure of success. For educators who need a wide range of standards, the ISTE Standards for Educators is one tool. From the Learner to Leader to Citizen, there is an expectation for growth. You’ve never had a 1:1 set of technology in place. Expecting that old standards (without tech) will work is less than accurate. Here’s an example: the responsible use of equipment. Students and staff may receive the new equipment and then begin to use it in ways not intended. Your campus leadership teams may end up trying to apply old discipline approaches. This will fail. Instead, you need to focus on experiences for learners that build relationship. This community building will translate into the use of restorative discipline approaches. Students and staff will promote positive management of personal data and digital identity. It all begins with a new standard for educators. Educators inspire students to make positive contributions. Students will act in a responsible way in the digital world. Now that you have new standards, what’s next? Make sure to align all professional learning to the new standards. This doesn’t mean re-branding so much as contextualizing your efforts. Before focusing on project-based learning design to make a connection. For example, PBL aligns to the Collaborator standard. That standard describes the use of collaborative tools like Skype in the Classroom that expand authentic, real-world learning experiences. These experiences are critical for students. You achieve authentic learning experiences that leverage technology. Problem: This is a short vignette or narrative explaining the problem. It is a story of what isn’t working. With the benchmark assessment data in hand, you will have little problem crafting this. Solution: Share a story of how the main character in the problem solved it. Describe how a specific technology facilitated the resolution of the problem. Professional Learning: Ready to try this on your own? Here is some professional learning you can take advantage of. For example, this could include self-paced videos, pre-recorded webinars, or upcoming face-to-face sessions. Think of these as mini-professional learning opportunities. They may involve micro-credentialing (e.g. digital badging). Instructional Approaches: If this session aligns to district approaches, mention those. You could share differentiation, Marzano’s Nine, or others. Painting a picture can depend on infographics. You can create infographics or “portrait of a K-2 educator.” This portrait can focus on educators at differing grade levels. “Whatever process you decide on,” said Dr. Roland Rios, “decide on it ahead of time.” As a veteran of 1:1 deployments, Dr. Rios’ points are well-taken. For example, in my own experience, a school district implemented 1:1 with laptops. Their negative experience taught them a few valuable lessons. When it was my turn to work with the district on their deployment, they wanted assurances. One of those was that campus administrators would not get bogged down in discipline. The discipline quagmire had them over-monitoring students in classrooms. The initiative soured on them due to their negative, heavy-handed approach to discipline. Whether it’s discipline, technical support, parent contacts, or inappropriate usage, plan it out. It may be your teachers need to adopt new instructional approaches. It could be your administrators need a new classroom observation framework. Two examples of frameworks, by the way, are H.E.A.T. and Triple E.
Plan your processes means first anticipating, then decimating your problems in advance. Do this and save yourself some last-minute effort. “Define or be defined” goes the old saying. In my project management fundamentals class, I share a chart. That chart describes key action steps for any project you have to take. The first, most important one is defining success. The next is aligning your key performance indicators (KPIs) to organizational goals. These KPIs, known as metrics, become indicators of success. You want these to be as public as possible. Set key metrics and assessment measures for the 1:1 deployment. These KPIs are an actionable scorecard that keeps your deployment on track. They enable you to manage and reach your desired results. Now that we’ve explored the five steps to a successful deployment, here are some more topics. The Chromebook Deployment Checklist deals with infrastructure and bandwidth, device choice, and management. It emphasizes the importance of doing your research and connecting with stakeholders. I hope you find it useful! Ready to blend Google Suites for Education tools into inquiry-based lessons? A wide variety of approaches exist, none more popular than the 5E Model. Let’s see how the 5E Model combines with Google Suites for Education to make learning engaging. The 5E Lesson Plan model has five components. Those components appear below. With these, you will see specific examples of Google Suites for Education tools. Boredom in schools has a dire effect on learning. Bored students perform less well on tests (Source). In one research study, over half of students defined their school experience as boring. 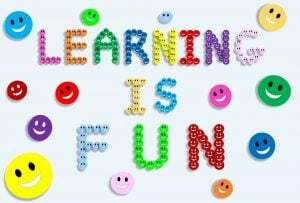 The 5E Lesson seeks to engage students so that they will retain learning. How can you accomplish this with G Suite tools? One approach involves creating virtual field trips. Rather than giving students a textbook map, have them make one. Students can use Google Tour Builder to create an interactive journey. See this example for language learning combined with history. Another approach may involve having students craft their own infographics. View this social studies infographic that captures the essence of infographics in schools. You can see many more examples of Tony Vincent’s #classygraphics online. Once you engage students in learning, make time for independent and group exploration of the topic. This allows them to develop and pursue interests grounded in the topic. Explore topics in such a way that students must figure things out without all the details being filled in for them. In PBL, this is known as presenting students with an ill-structured problem. When using G Suites for Education tools, use the new Google Sites to create a digital breakout. Why does this approach work? It challenges students to pay close attention to details that lead them to create their own gestalt of the topic. The mind, psychologists say, has “an innate disposition to perceive patterns.” Not sure how to create your own digital breakout with Google tools? See this list of resources. 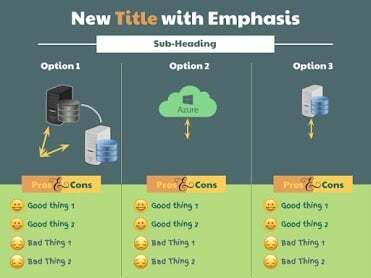 Another way to use G Suites is to create a digital choice board or multimedia text set (MMTS). Find ample examples of both online. Students have had the chance to be engaged. They have explored the topic in detail, so now you can start to share your expertise with them. One way to scaffold student learning has them creating a T-chart to help them examine two aspects of an object, situation, or event. This allows them to compare diverse ideas. You can create T-charts in Google Slides, Google Docs, or Google Drawings. Find other chart templates here. Learners may often need to revisit a topic from a different angle. Using differentiation techniques, you can empower students to dig deeper. The purpose of the focused hyperdoc is to allow students to explore a topic from various angles. 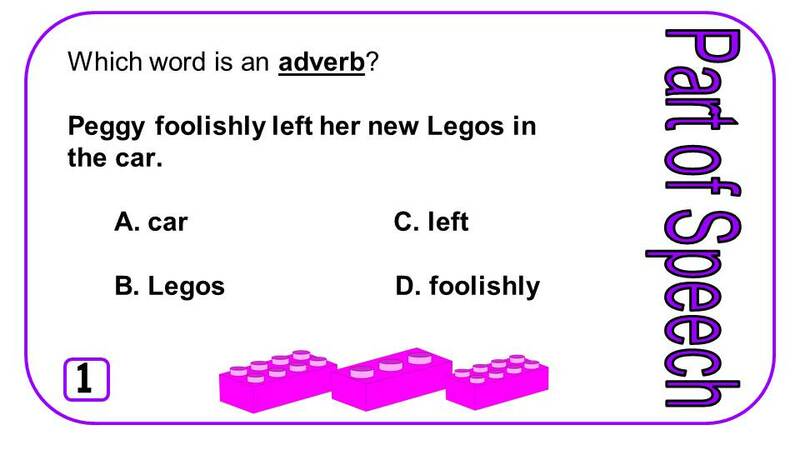 For example, elaboration may involve enriching or extending a lesson. For other students, revisiting an activity at a slower pace with more teacher support may be needed. One simple approach involves a focused hyperdoc. You can create a hyperdoc that either extends, enriches, or scaffolds student learning. Rather than create a detailed hyperdoc, use one of the simpler templates available in Google Docs. Ready to assess? 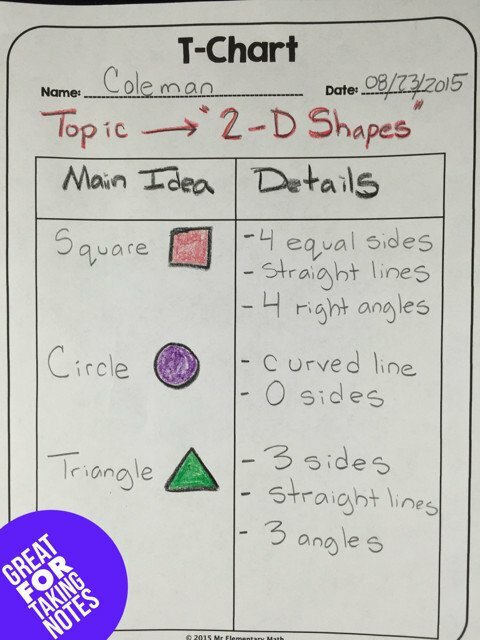 Have students use G Suites tools to create visual representations of their ideas. These creations can take many forms, whether Google Sheets graphs of data or something more creative. For example, students can design digital ebooks with Google Slides or Google Docs and then export them to ePub ebook format. You may have read of all these approaches in TCEA TechNotes blog entries. Remember, the 5E Model can be combined with G Suites tools. It’s easy to imagine any one approach as the only one to use. Blend them to create engaging lessons that showcase student learning. In part one of this series, I shared some of the scenarios for recognizing a data warehouse. In part two, please allow me to share a sample proposal. The proposal follows the model outlined in this blog entry, Solving Wicked Problems: When Details Matter (Part 3). Before seeking a data warehouse, it’s important that a school district take stock and organize itself. Before starting down the road, district staff need to have a realistic understanding of how data flows. Administrators looking for a procedure document may find one here. That flow varies from district to district. Below, you will find the diagram that captured the flow of data in my district. Before I created it, few had a clear idea of how data moved from one place to another. In fact, it might as well have happened via magical means. This process needs to be mapped for each data file that will be tapped as a source for student data in the data warehouse. Curriculum director contacts technology director and a joint meeting takes place. After speaking with the vendor, a comma-delimited file needs to be created nightly that contains students’ firstname, lastname, campus, student ID#, TSDS#, district username, and password. A tentative start date is set for when this is needed. Curriculum director and end users (e.g. teachers in grades 3-8) verify that information in the vendor system is up to date. This data file creation process is offered as an example. The intent of sharing this is to help you review your own processes for data file creation. The purpose of this proposal is to 1) facilitate easy, safe, and appropriate access to data that campus and district staff need to accomplish essential job functions, and 2) eliminate time staff currently waste in data hunting and gathering, sifting, and organizing that consumes more time than the data analysis component requires. The end result is a more informed leadership and better decision-making in the service of students and staff. Achievement of the tenets of this proposal enable staff to have tiered levels of access to generate reports derived from data critical to their job functions via a web-based interface to a data warehouse of content. A data warehouse – This component serves as a district-controlled repository of all data–a local copy regardless of the source–on students and employees from a variety of data sources including, but not limited to, student assessments, student and parent lists, employee data from internal (e.g. Eduphoria, special education, Scholastic programs) and external sources of data (e.g. STAAR, iStation, iTCCS, TxGradebook, eSPED). A web dataportal – This component provides as a browser-based, easy to use interface to the data warehouse that enables campus and district staff to have point-n-click query-creation abilities to generate a variety of reports that juxtapose data from a variety of internal and external data sources. Assessment Office: The district lacks a locally-controlled, central repository of all–Eduphoria Aware only provides some access–student/staff data, making it a time-consuming (e.g. hours to weeks) chore to correlate data from multiple sources (e.g. SMI/SRI and STAAR). 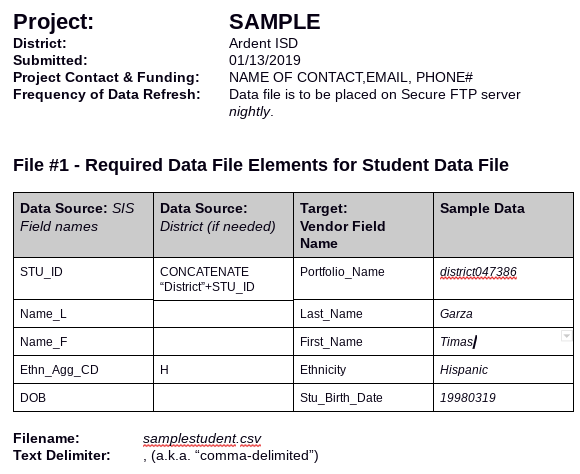 Bilingual/ESL: TPRI/TejasLee staff and student data exports have to be obtained via a single district person, and this can involve wait time. Curriculum Department: Lack of a customizable data aggregation and reporting functions that are automated and easy to produce force reliance on a single person to generate reports for various locations. Campus Level: Staff spend hours per day, even weeks, tracking and sifting through data to create end of course (EOC) student lists that could be generated with a custom query that had access to all data sources. Furthermore, staff must keep track of alternative measures using Excel spreadsheets, which they assert is time-consuming and error-prone. 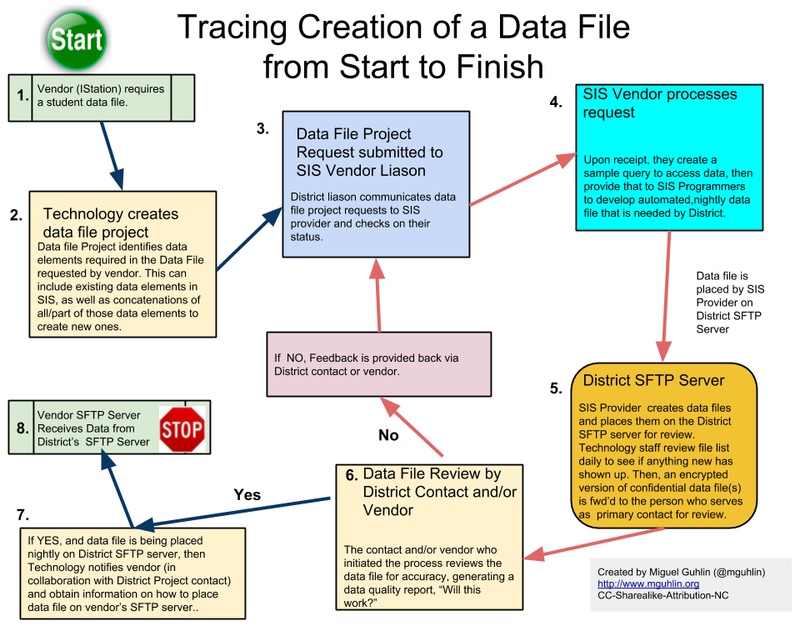 iTCCS Access: The district currently has to provide ALL or nothing access via Open DataBase Compliant (ODBC) connection to staff, making it difficult to grant general users access to a subset of sensitive, confidential data they need to work. Special Education: Both district and campus staff have to correlate data between the student information system (SIS) and vendor systems–whose disparate systems are unable to “talk to each other”–to get the results needed to serve special populations. Technology Operations: The technology department must manually manage and try to create student/staff listing for an increasing variety of vendors. This involves manual updates that must be done daily, requiring a full-time, dedicated staff member simply to ensure account management is handled. Note: Videos of stakeholders are available to provide specific details. A diagram (presented in part one of this blog entry) of how this would work appears in this section. It is modeled on how other districts’ data warehouses operate. Beginning at the top, end-users, whether at the campus or district level, would be able to interface via their web browser to a local repository of data. End users would be able to generate a variety of custom reports that juxtapose data they need to provide student level interventions (e.g. EOC, dropout, alternative measures, SMI/SRI to STAAR correlations, projections based on existing data to state/national standards). End users would not require an ODBC connection to the student information system (SIS) or administrative level access, instead running reports that give them access to data customized for their job function (e.g. principal vs. teacher) and location (e.g. campus staff can only see their data). This data is composed of information gleaned programmatically and updated nightly via automated connections. Data flows from the SIS and other external data sources into the data warehouse. These automated connections–operating as many as two times per day–synchronize the data available in the Data Warehouse. $85K – $95K: DataBase Administrator (DBA) – Job description attached. A local repository of databases and tables (e.g. MySQL/MariaDB, MS-SQL) that mirror internal and external data sources that is updated two times per 24-hour period. A secure (HTTPS) web data portal that enables end users to have tiered-level access to data via queries that interface with the data warehouse and generate reports in HTML, PDF, and XLS formats for easy viewing and manipulation. Description: Specialized software and servers will be needed to create the data warehouse and web data portal. This cost is not anticipated to impact until year 2 after the DBA is hired. Description: The identity automation component–which can be independent of a data warehouse–enables automation of 95% of current account creation/login management, elimination of work, and systems integration. The $30K is an initial cost that will drop to approximately 10% after year 1 launch. 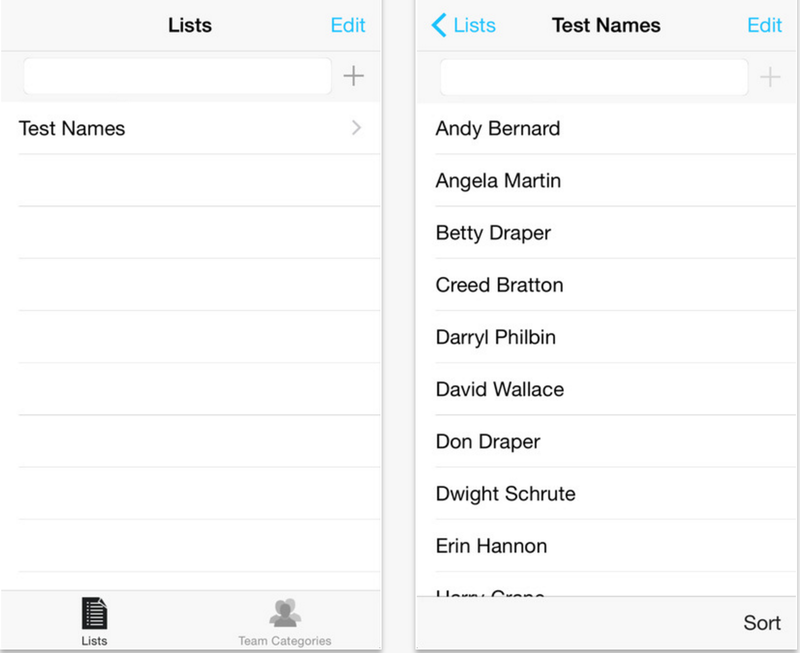 Develop data join queries that merge data from multiple sources of data. Map out data queries to obtain desired reports (e.g. EOC tracking, dropout reports, correlations, and projections). Create tiered access matching staff member’s right to data access. Create district web portal that presents desired reports. Enable access for district and campus staff. Enable drill-down data mining for teachers to student level. Enable teacher/parent/student web portal views and reports. Success is defined by achieving all phases defined above. As you begin the process of putting in place a data warehouse, you may be tempted to seek out a vendor partner who can help you bridge the gap from where you are to where you need to be to see student data in a usable way. Be careful that before you involve a vendor, you are prepared to change how you work. Perhaps even more important, make sure that you have top level support to change the workflows for others in your organization. In part three of this series, we will take a look at finding a vendor partner. I hope that all of you are registered for the TCEA 2018 Convention & Exposition by now and are starting to get excited about the event. This year’s content promises to be the best we’ve ever had, and I can’t wait for you to experience it. But with five full days and more than 1,100 opportunities to stretch your mind, it may be a little overwhelming. Knowing that, here are four tips for a successful event, gleaned from my participation at more than 35 TCEA conventions. Admittedly, I am something of a control freak. So just winging the entire convention is definitely not something I’m comfortable with. But to be honest, there is literally so much going on that, if you don’t do at least a little planning up front, you will miss out on something amazing. So, decide first what you want to learn this year. You can certainly just pick a basket of mixed content, if you want, and go home with lots of innovative ideas. But I have found that the best learning I experience is when I am focused. So, what do you want to learn? Are you trying to solve a particular problem? Is your campus or district implementing something new? Do you need resources for a specific subject area? Are you wanting to grow your leadership skills? Do you need practice in the latest educational trend? Are you trying to determine what perfect tech tool to purchase? Whatever it is, I can promise you that you’ll find it at the convention. 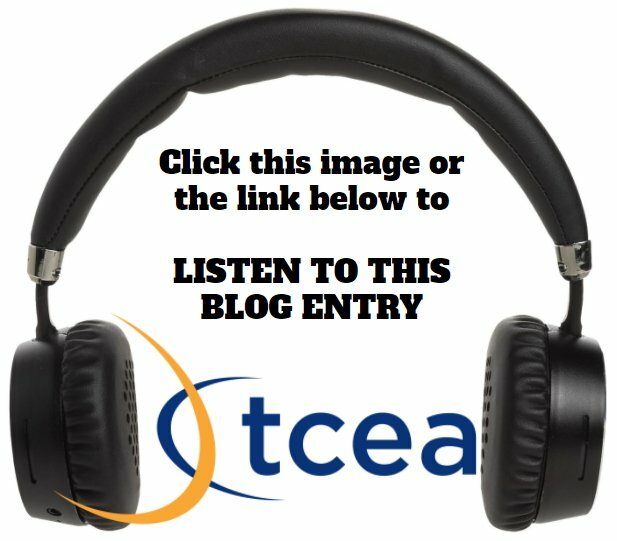 But take the time to write down your response to the following to make sure that you get everything you can out of the experience: “I will know that my time at TCEA 2018 was well spent if I walk away with _________.” That’s your “one thing,” what you will concentrate your time and energy at the convention on. That doesn’t mean you won’t learn about other things, just that your primary goal is to accomplish this one task. I am always a little frightened by the attendees who show up onsite at the convention that first morning and then start looking in the printed program to see what they want to attend. Again, there’s just too much going on for that to be effective. Instead, spend some time up front getting familiar with what is being offered. First, see what big events are going on this year. Even if you’ve attended the convention for a long time, we make slight changes every year and provide new sessions and events. What’s new this year? The convention adds to its topics each year as new technologies come out. So what is being emphasized this year in the interactive learning spaces? Does that fit in with your one thing? If so, how much time will you need to spend there? The 2018 convention is offering Solution Circles this year, which are 50-minute facilitated, round-table conversations where attendees will discuss common problems, explore solutions, and share resources in small groups. You can see the list of topics and times here. Will one of these help educate you more about your one thing? Don’t forget about the great learning going on in the poster sessions. These come-and-go opportunities allow you to talk face-to-face personally with knowledgeable peers in a relaxed setting. Next, spend some time searching for specific sessions about your one thing. You can do this with the filter and search capabilities of the convention website. The general search feature will return sessions, speakers, and exhibitors that match the keyword you searched for. 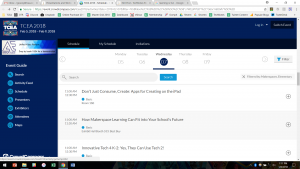 You can also use the more powerful filter function (on the right side) with select tags (such as 1:1, coding, differentiation, or leadership). For example, in the search below, I am looking for ideas on implementing a makerspace in an elementary campus. Make a rough draft of a possible schedule of sessions to attend, leaving in some free time for impromptu conversations with peers, visiting the massive exhibit hall, and any spur-of-the-moment learning opportunities that may crop up. You don’t have to necessarily follow this schedule completely, but it will give you a place to start when you get onsite at the convention center. One more thing about your schedule. Make sure you download the free TCEA app before you arrive. This will be the best way to keep current on any possible changes in the sessions being offered. One of the most powerful learning experiences may be one that you’ve never had before. The convention is the perfect place to expand your horizons and try something new. If you’re normally reluctant to meet new people, try introducing yourself to others in a session you attend, at a Solution Circle, or while resting your tired feet in a corner chair. If you don’t normally interact with the exhibitors much, then spend some time with a vendor who offers something related to your one thing and really dive in, getting hands-on practice and all of your questions answered. If you’re not typically a joiner, then stop by and learn about one of the Special Interest Groups (SIGs) in the TCEA membership booth and discover what they have to offer you. Put on your “I’m confident” hat and add a new experience to your convention activities. I also strongly encourage you to stop by the TCEA Membership Booth during the big event and say “hello.” Introduce yourself to Director of Membership and Marketing Joe Vasquez and Membership Assistant Erin Taylor and let them share with you how TCEA can continue to support you long after the convention has ended. Your convention registration includes a free year of membership, and you won’t believe all the solutions and resources that will provide to help you with your one thing and many others. Creating groups for differentiation can be hard or easy, depending on how many students you are working with and how often you want to shuffle your groups. In each group, you may want to allow students to self-select a role with accompanying responsibilities or randomly assign the role. This isn’t a difficult task. Another task that can be more onerous is randomly splitting up your class roster into equal-sized groups. While I usually do this based on seating arrangement (usually, teams of four students per desk group), you can also do it using online programs. Before we explore those, let’s revisit roles and responsibilities students may have. 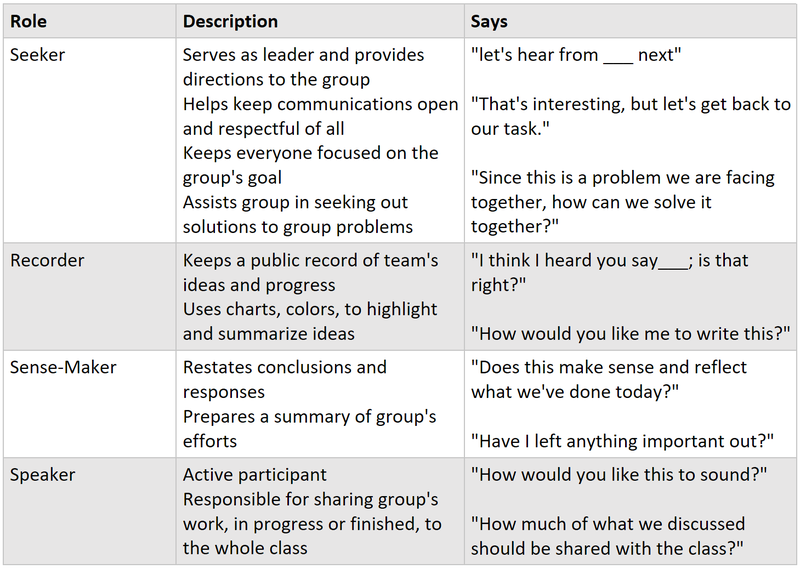 While entire books have been written about cooperative learning, you are hoping to define individual group member roles in a way that eliminates problems, and facilitates the work of the group. A more modern take on roles and responsibilities is explained in this blog. Organizing large collections of students into small groups can be a time sink at the start of the year. You don’t yet have the relationships with students that guide individual placement and students lack the experience and trust needed for group work. Organizing random groups can be a fun way to assist students to build relationships in the face of a common task. Here are a few tools you can use as teacher that will help. 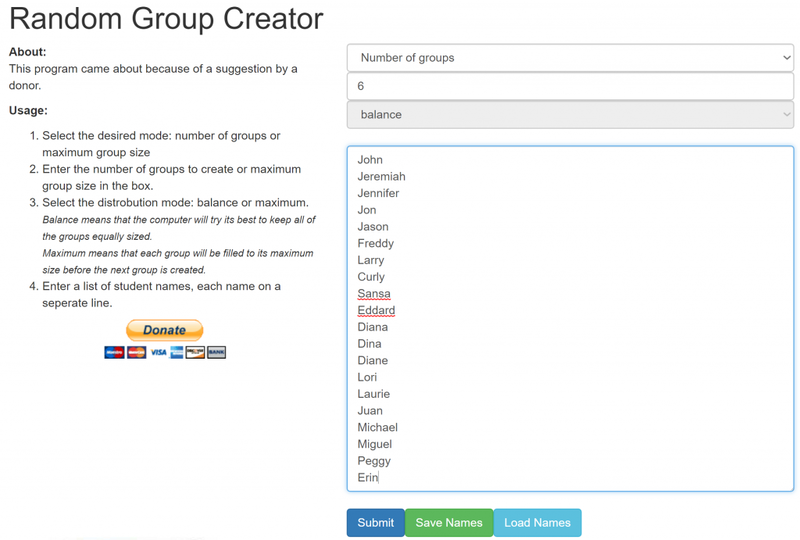 For each tool, you will need a list of students that you can copy-and-paste as needed, as well as how many people you want in each group. 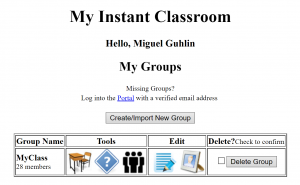 The Instant Classroom Group Maker makes creating groups easy. Being able to save your work means that My Instant Classroom affords you features other random group makers lack. For some, though, it may be a bit too much. Do you often rely on Google Suites for Education? 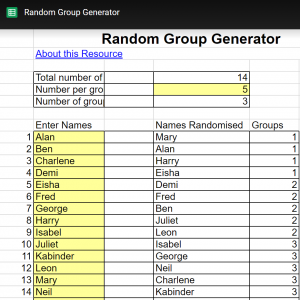 Then this Google Sheets Random Group Generator template may be just what you need! What’s neat about it is that you can re-use it to quickly shuffle your class and not have to worry about re-typing or copying-and-pasting your students’ names in. As nice as these two tools are, they may both still be too much. Let’s take a look at some simpler alternatives. 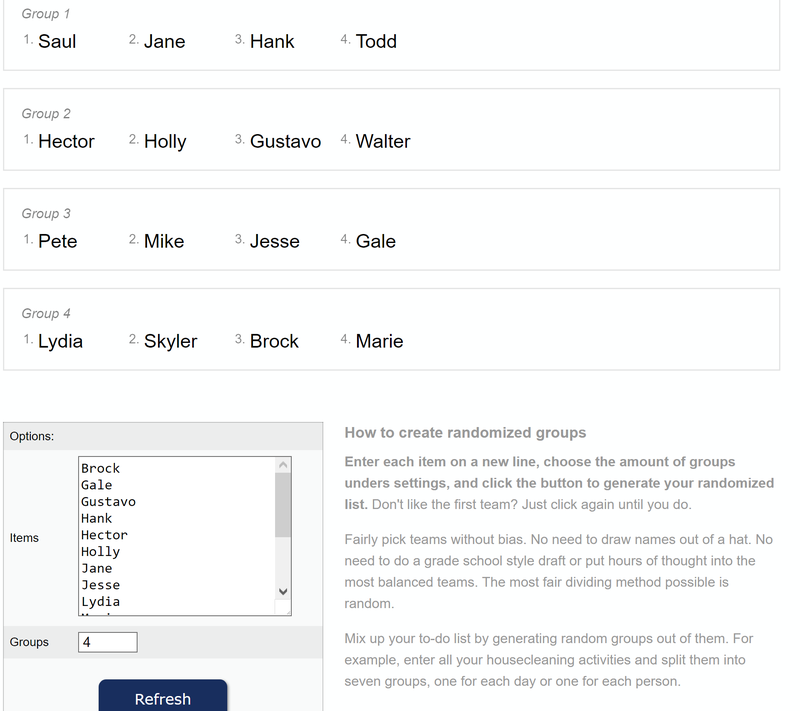 Another option is the Random Group Creator. Although plagued with pop-up advertisements, these can be dismissed. 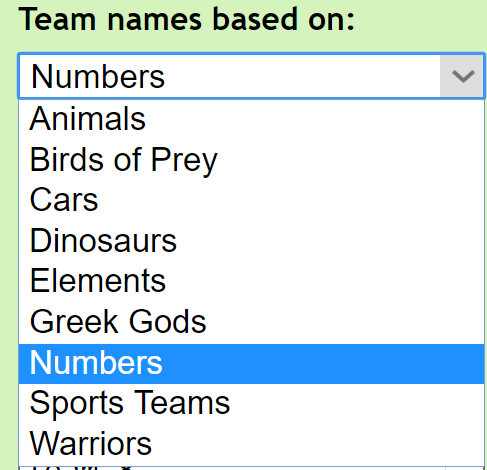 You select the total number of groups you need, then copy-and-paste your class roster into the big box. 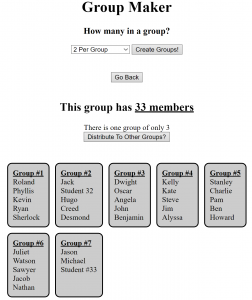 This simple interface, and the fact it labels the names of the groups, makes it one of my top two picks for group making. 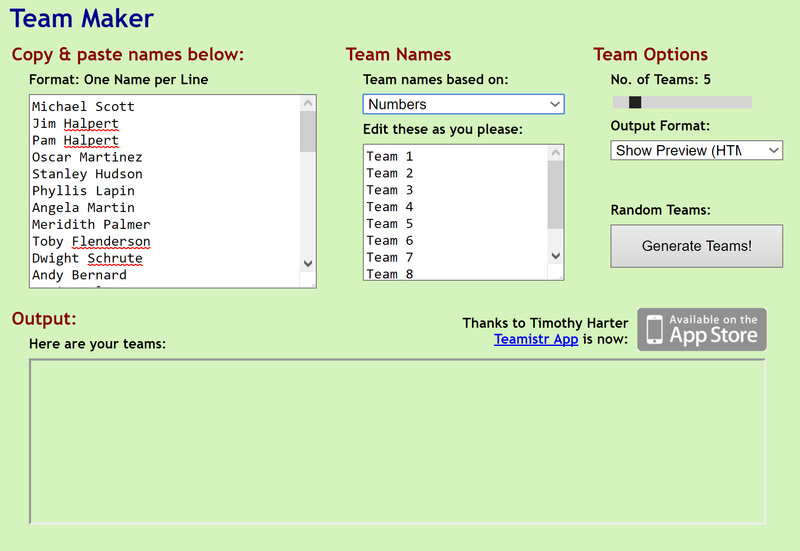 This last group maker, Team Maker, facilitates group creation with a few extra perks you may like. As you can imagine, the last thing you want to spend time on is organizing random groups of students. These five tools will speed you and your class along to the point they can build trust and academic relationships needed for group success. Keeping students engaged while practicing their math skills can sometimes be difficult. But luckily, there is a powerful and free platform available for grades 1 through 8 that will help them achieve mastery and have fun doing it. And that platform is Prodigy. More than 15 million students around the world are using Prodigy right now, a curriculum-aligned math game for elementary and middle school learners. With more than 1,200 crucial math skills covered and a guarantee that the product will ALWAYS be free to educators, you will definitely want to get your students registered to use this program. It begins with a diagnostic test for each student so that they begin working on their best level and follows up with embedded assessments and differentiation. And the teacher can see individualized reports about each student’s progress at any time. Played like a video game, the platform includes the ability to create a persona, take part in quests, level up, and engage in social learning. It is game-based learning at is finest and most engaging. And the research behind the math learning is spot on, so as a the teacher, you know that your students are learning what they are supposed to be. 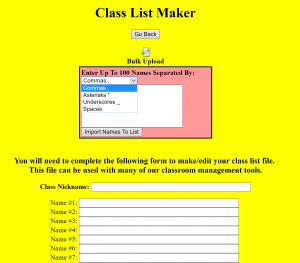 To begin using the program, the teacher creates an account with name, email, and password. Then you must select the curriculum you want your students to use. Choices include the Prodigy Math Curriculum, which is the default, along with Common Core Math Standards, Florida standards, and yes, standards aligned to the Texas TEKS. Set up your class and enter your students and then determine on what topic you want them to start. Then you are ready to go. You will receive a URL for each class created for your students to enter, along with a unique class code. Students will then be asked to create a character and can start playing. Prodigy works on any device that can connect to the Internet, which makes it perfect for the BYOT classroom. In addition, there is also a Chrome extension for the game. 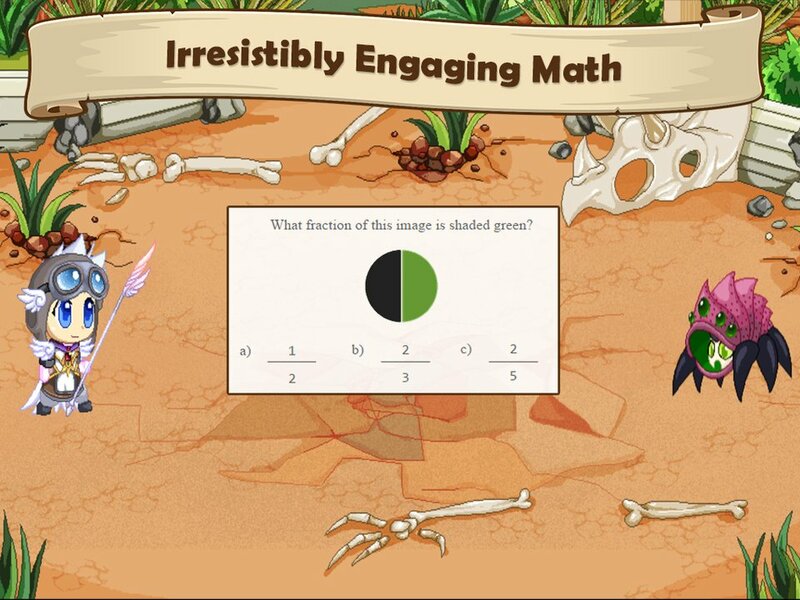 The game even includes virtual manipulatives for the students to use, along with text-to-speech/question read-aloud features. And in case you’re wondering how Prodigy is paying the bills, they sell an optional membership to parents that allows them to see exactly what their child is working on and how he/she is doing. In a time when some educational companies promise, but don’t deliver, and when those that do may come with a hefty price tag, Prodigy is a beacon of what is best for student learning. Create your teacher account today and get your kids engaged! With more than 1.3 million iPad apps now available in the App Store, it can be difficult for a busy educator to find the best ones for a particular lesson or purpose. But don’t worry; with TCEA, you’ve got this! Below is our list of absolutely must-have iPad apps for when students (or educators) need to showcase their learning with content creation. The apps take a variety of inputs, from audio to stories to digital images, which is great for differentiation. And they’re all free! Adobe Spark Video – Pick from over 25,000 beautiful, iconic images to show your ideas and Spark will automatically add cinematic motion and a soundtrack. Doodle Buddy for iPad – A longtime TCEA favorite, this app lets you finger paint with thousands of colors and drop in playful stamps. It has lots of cool drawing tools: paintbrush, glitter, chalk, text, stencils, smudge, and more. You can also draw on photos and drawings of your own. The free version includes ads. Popplet Lite – With Popplet, you can capture your ideas and sort them visually in real time. This app is great for mind mapping and brainstorming, along with creating galleries and class notes. The lite version limits you to just one popplet at a time saved. Puppet Pals HD – Create your own unique shows with animation and audio in real time! Simply pick out your actors and backdrops, drag them on to the stage, and tap record. Your movements and audio will be recorded in real time for playback later. The free version includes one background/theme. There is also a newer version of the app called Puppet Pals 2. Quipio – Create amazing messages in a poster format by adding your own photos or drawings and text. Very simple to use. Shadow Puppets EDU – Easily create videos in the classroom. Students as young as five can make videos to tell stories, explain ideas, or document their learning. Sock Puppets – Sock Puppets lets you create your own lip-synched videos and share them on Facebook and YouTube. Limited backgrounds are included; additional may be purchased. TeleStory – This fun app lets you create your own TV show with a theme, script, digital costumes, animation, voice recording, and more. Toontastic 3D – Toontastic is a creative learning tool that empowers kids to draw, animate, and share their own cartoons through imaginative play. Making cartoons with Toontastic is as easy as putting on a puppet show – simply press the record button, move your characters onscreen, and tell your stories through play! Once you’re done, Toontastic will play back your animation and voice as a cartoon for you to share with friends and family around the world. The free version contains one background/theme. Trading Cards – Using the on-screen questions as prompts, students can create trading cards of real or fictional people, places, objects, historical events, vocabulary words, and more. VoiceThread – Create and share dynamic conversations around documents, snapshots, diagrams, and videos — basically anything there is to talk about. You can talk, type, and draw right on the screen. The app is free with additional in-app purchases available. Five VoiceThreads may be made with this app. And one more that’s not strictly educational, but certainly is fun and engaging and gets your creativity going. Let’s Create! Pottery HD Lite – I love this app! Making ceramics has never been more simple and fun. Become a true artist and create “one of a kind” pottery items and share them with your friends. The lite version contains fewer add-ons and decorations. On January 11, 2017, Google announced some powerful new features for Classroom for both teachers and administrators. Both of these features really focus on providing the ability to personalize learning. For teachers, the program provides for more differentiation. A teacher can now decide which student/s should receive a specific assignment or question, allowing her to personalize the learning more. To make this feature work best, the teacher should create subsets of students based on their unique needs. This is perfect for allowing struggling students to practice more or to provide an extension activity to students who have already mastered the content. And, with the update, teachers will also receive two new Classroom notifications: one when students submit late work after the due date and the other when students re-submit work. Google administrators will now see Classroom data included in the Admin Console Reports. You will be able to see the amount of time being spent on Classroom and how many posts are being created. You can also view this data schoolwide, on a class-by-class basis, or by individual user. This will make it easier to target professional development for staff who may be struggling with how best to use Classroom. Thanks to Google for continually listening to educators about the needs for this wonderful tool!